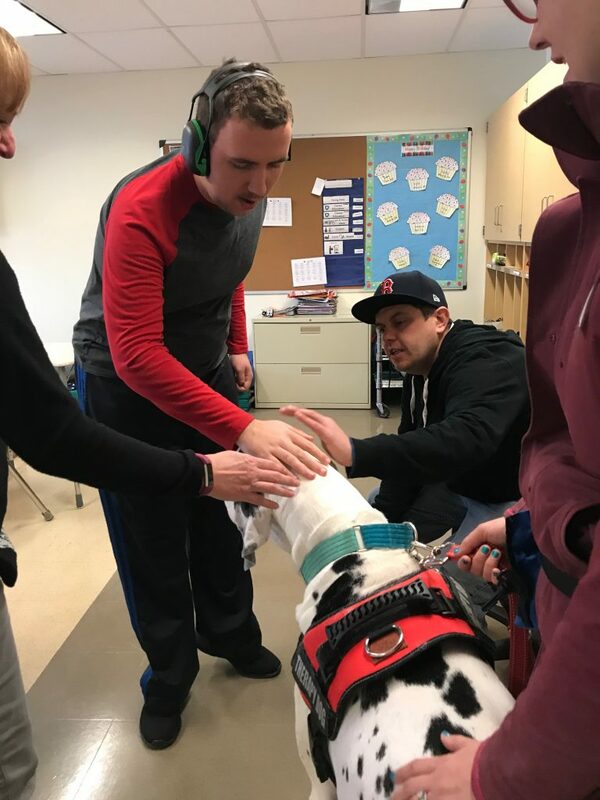 Spaulding Youth Center is excited to announce a local therapy dog named Rose has been making bi-weekly visits to its Northfield, New Hampshire campus. Rose, a five-year-old Great Dane, is a graduate of the American Kennel Club (AKC) Canine Good Citizen® (CGC) Program, which she completed at Doggonit Training in Laconia, New Hampshire. The AKC’s Canine Good Citizen (CGC) Program is a two-part program designed to reward dogs who have good manners at home and in the community. Many dog owners complete CGC training and testing as a prerequisite to therapy dog certification. Rose serves as a therapy dog on Spaulding’s campus every Monday afternoon, where she visits students ranging from age five to twenty-one. The children take turns petting even reading to Rose, which gives them a fun and unique opportunity to practice their skills in phonics, public speaking and socialization. 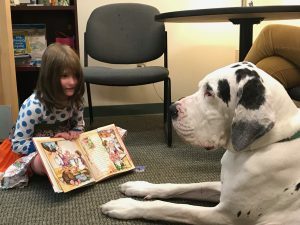 Therapy dogs like Rose help ease social anxiety and create a calm atmosphere for children and youth facing behavioral, emotional and physical challenges. Mr. and Mrs. Stevens previously adopted a child who had been enrolled in Spaulding Youth Center, so the organization holds a very special place in her heart. Visit https://www.doggonitnh.com/ to learn more about Doggonit Training and their various training programs, including the American Kennel Club (AKC) Canine Good Citizen® (CGC) Program.